Does Anybody Actually Believe Karen Carter Peterson's Story? Does Anybody Actually Believe Karen Carter Peterson’s Story? Count us in among those who think that if any real investigation is done on why State Senator Karen Carter Peterson, who doubles as Chair of the Louisiana Democrat Party, received a summons from the Louisiana State Police out of a visit she paid to L’Auberge Casino in Baton Rouge at the end of February, we’ll discover that her cover story doesn’t hold up too well. 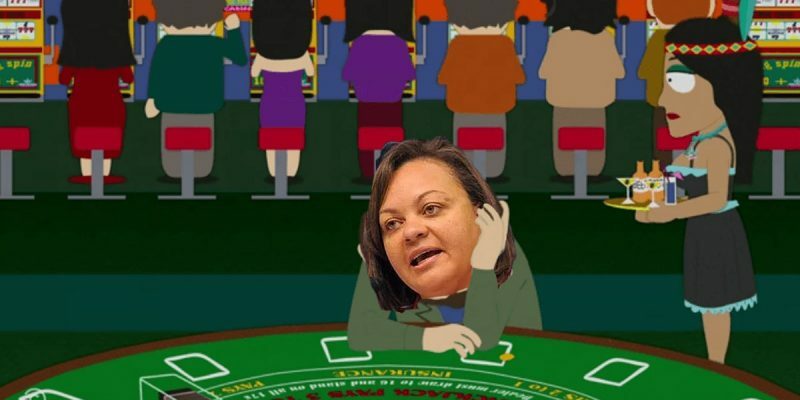 Karen Carter Peterson, who is both a state senator from New Orleans and chair of the state Democratic Party, disclosed in an email Friday night that she has a gambling problem — minutes after WWL-TV posted a news story reporting that she had violated a ban on entering Louisiana casinos. A Louisiana State Police trooper issued her a misdemeanor summons for violating a self-imposed ban when she gambled at L’Auberge Casino in Baton Rouge last month, the station reported. A State Police spokesman confirmed that his agency issued the summons but declined to comment while the misdemeanor charge is under review by Hillar Moore III, the East Baton Rouge Parish district attorney. In her email, Peterson said she has suffered from a gambling addiction for years. Peterson said she has struggled with the gambling problem for years. One effort to stop it came two years ago when she voluntarily entered a program that made it illegal for her to enter almost any Louisiana gambling establishment. Peterson said she was going public with her gambling addiction because someone had leaked the State Police summons to a media outlet, presumably WWL-TV. Is it possible that Peterson was recognized when she darkened the door of the casino, and escorted out on the spot? Sure. That’s possible. Is that likely what happened? Nope. There are two much more likely possibilities. The first would be that Peterson got marked when she tried to cash in her chips, because casinos do their best work identifying illicit players at the cages. But there’s an easy way to get around that – you don’t cash in those chips. You have somebody else do that for you. Presumably Peterson wouldn’t be so stupid as to march into that jackpot (weak pun intended) without employing a confederate. The other likely possibility, the one we would bet on, is that Peterson did something to arouse attention. And given Peterson’s track record of outrageous and abusive public conduct – quick examples of which can be found here and here – we can imagine what that might have been. This is somebody who curses out fellow legislators on the floor of the House of Representatives and who destroys private property because she gets her feelings hurt. She exhibits psychopathic tendencies on a fairly regular basis and has a reputation for such. The idea that she got pinched simply for showing up at L’Auberge without any outbreak of nutty behavior doesn’t really wash – unless there was such bad behavior in the past which has casino staff and security on high alert for her entry. What we would ask is that Karen Carter Peterson come clean as to why she was issued that summons – and if she will not, we’d like to see the police report arising from it. We know she won’t be prosecuted – Democrat politicians in Louisiana are never, ever prosecuted under state law; that falls to our U.S. Attorneys and always has. The truth isn’t too much to ask of someone who styles herself as a public servant – particularly given that, as a member of the Senate’s Judiciary B committee, she’s taken part in legislation governing casino gambling in the state. And Peterson’s minion Stephen Handwerk, who does her bidding as the executive director of the Louisiana Democrat Party, ought to be asked to apologize for trashing Andrew Bautsch, the executive director of the LAGOP, last week. Bautsch was married a week ago last Friday, and after an unfortunate – and, frankly, a bit suspicious – row at a hotel after the reception, Bautsch was arrested on misdemeanor charges. Handwerk issued a statement attacking Bautsch for the arrest when he had to know that his own boss had recent legal problems of her own. There is much egg on Handwerk’s face today. He’s a bloody hypocrite whose credibility has taken a negative turn. We’d like to see some full disclosure from these people. But we don’t want new leadership atop the Louisiana Democrat Party. We like this clownshow just like it is.